Welcome to another week of Weaning Wisdom Wednesdays. 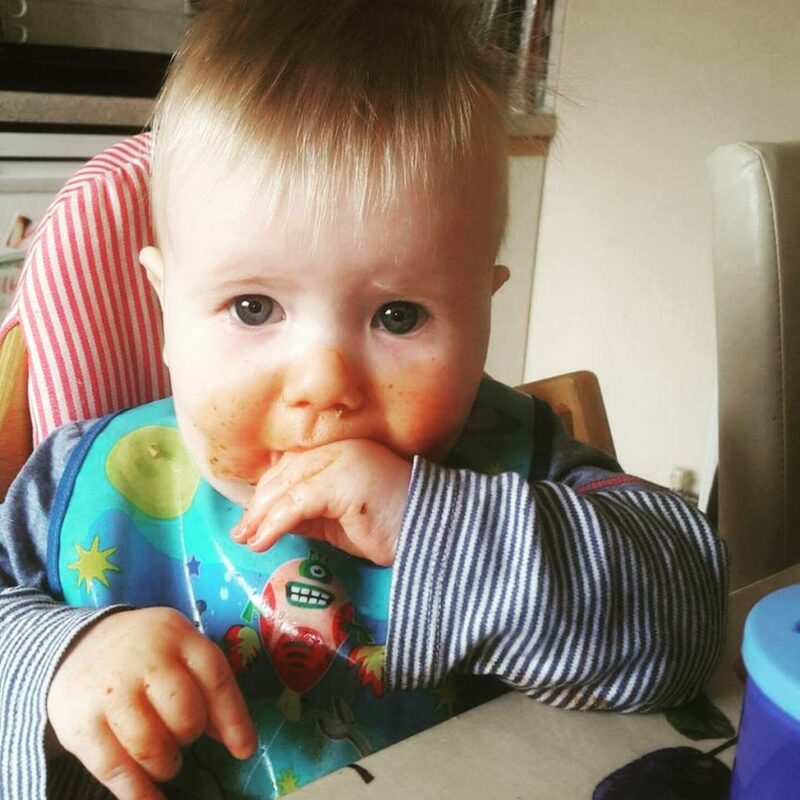 Each week I am joined by another blogger who imparts their weaning wisdom. There are so many different methods of weaning out there and it’s so nice to read all the different ways each week. This week I am joined by Kayley from Friendly First Foods. Take it away Kayley…. Hi, My name is Kayley, I’m 29 years old and live in Stockport with my husband Alistair and our son Harry. We are expecting our second child in September and can’t wait to embark on a new, exciting weaning adventure with our daughter when she arrives. Harry is 2 years old in June and loves his food! He’s the inspiration behind my blog and has caused us all to fall in love with healthy eating again. We planned to go down the baby led weaning route, and predominantly this is what we did. Harry was given finger foods from the start and self fed most of his meals. He was a hungry baby though and would often get impatient. We helped him with foods like yoghurt and Weetabix as he would become frustrated when he struggled to do it himself, but other than that he fed himself. We weaned Harry when he was 5 and a half months old. We consulted with our Health Visitor and decided that, as Harry was showing all of the signs that he was ready, we should start offering food. He had good hand to mouth coordination, could sit unaided and was showing an interest in food. Obviously it is recommended that babies wait until they are 6 months before they are weaned but as with everything, babies develop skills at their own pace and I’m confident that we did what was right for our son. We started with first tastes of vegetables, we offered finger sized and shaped pieces of steamed vegetables and let him go for it. Harry quickly picked up how to eat and loved food straight away. He soon wanted food whenever we had it and was quickly eating three ‘meals’ a day. Some of Harry’s favourite early meals were things like mini veggie omelettes, sweet potato cheese balls, tuna croquettes and homemade tortilla pizzas. Harry loved most foods to begin with. He would try anything we gave him and usually ate a decent amount of it. The only foods he seemed to take an instant dislike to were broccoli and cauliflower, which is funny as he loves them now. Harry’s favourite food when he first started weaning was probably Weetabix, he loved them! When we were out and about we would pack a little packed lunch with veg sticks, houmous, savoury muffins and fruit. We also liked packet snacks like the Organix range as they are so easy to grab and go. We used a Stokke Tripp Trapp and would definitely recommend it to other parents. We really wanted a high chair that would mean Harry could sit at the table with us so we could eat as a family, the Tripp Trapp was perfect for that. Because it is so easily adjustable the chair has grown with Harry and now, with the straps removed, is the perfect height chair for him to sit at the table without needing a booster on a normal chair. Personally we haven’t given Harry fast food and he’s almost 2. He does have healthy versions of fast food, we make him healthy tortilla pizzas, homemade chicken nuggets, healthy turkey burgers, spicy curries and Chinese noodles. I’m sure that one day he will have fast food and when the time comes I wont feel guilty as I know that the majority of the food he eats is extremely healthy. Personally I think that children need to learn about a balanced diet and enjoying everything in moderation, we give things like chocolate and biscuits occasionally so that Harry can see that these are ‘sometimes foods’ and will hopefully learn that they are something that it’s ok to occasionally have a little of where as fruit and vegetables are foods that he can eat as much as he likes of. The most challenging aspect of weaning for me was learning to trust my instincts and Harry’s cues. There are so many people out there who will want you to stick to one specific style of weaning or want to criticise the choices you make. I’ve since learned to trust my abilities as a mother and ignore the background noise. My child is healthy and happy so I can’t be doing too bad a job! The main criticism I received was because I followed a baby led weaning approach to weaning but also supported with spoons. 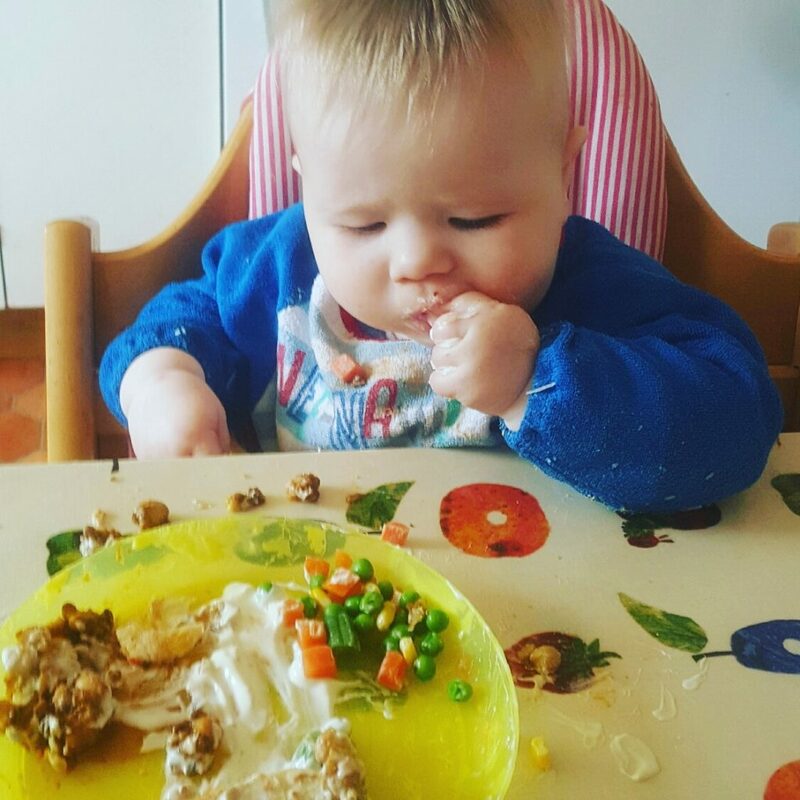 I had some people telling me that I was damaging my child and he wouldn’t be as clever later in life because I didn’t stick to pure baby led weaning. I mean, seriously? Can you believe some people? What a load of nonsense! Personally I support any parent who makes informed weaning choices that suit their child and their needs. We do meal plan, mainly for financial reasons. When I returned to work after maternity leave we made the decision that I would only work two days a week. This means our combined income has dropped a lot and on top of that we have an extra mouth to feed. We find that meal planning helps us to ensure our family gets nutritious, balanced meals over the course of the week and has helped us to cut our weekly food bill in half. One of my favourite weaning purchases was one of the cheapest! I purchased a pack of 10 face clothes from Ikea for a couple of pounds and it saved us a fortune on baby wipes! 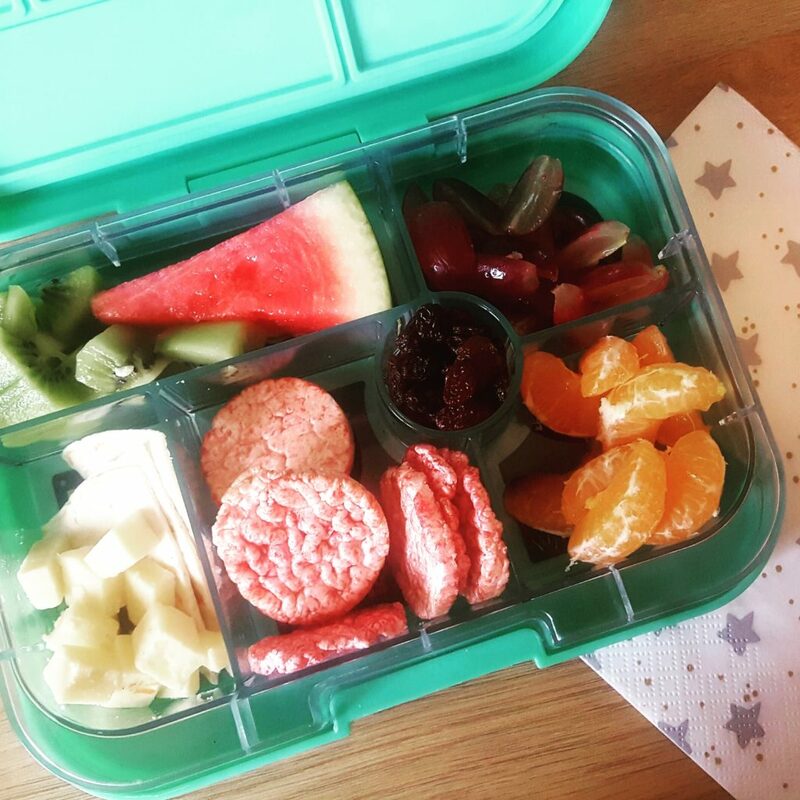 Another weaning item that I wouldn’t be without is our Yumbox. It has made it so much easier to take a meal or snack out with us for Harry and the fact that it can hold yoghurt and is leak proof means one less thing to have to worry about! The only thing I would do differently if I did it again would be to trust myself more and not listen to critics. This time next year we will be weaning our daughter and I am sure that will be a whole new weaning experience completely different to our first. This time around we have the confidence in ourselves as parents to trust our instincts and follow her lead, without worrying about what other people have to say about it. Relax, don’t panic about which approach to weaning you ‘should’ take, how much your child eats initially or whether you are doing it right. Every baby is different and will get there at their own pace in their own way. If you look at a group of 5 year olds sat eating their lunch together you would never be able to tell which children were weaned in which way, you will just see a happy group of children enjoying their food. Whatever approach to weaning you take I am sure will be the right one for you. Always remember, you’re doing great. Thank you so much to Kayley for joining us! I really wanted a Tripp Trapp so it’s lovely to read positive feedback on it – I’m hoping to convince Dave to buy one once the kitchen is finished! !